Start off your holiday shopping with us at the 17th Annual Chamber Show & Sell in Madison, SD. Madison's largest craft/vendor show. 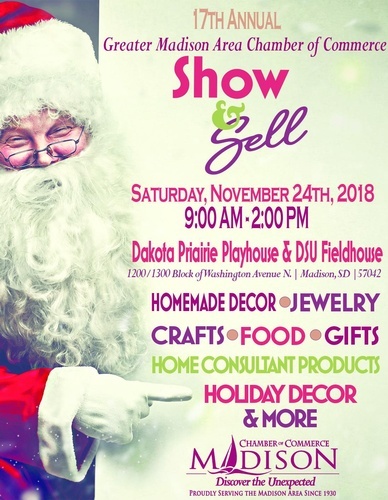 Over 125 Vendor Booths: Arts, Fashion, Accessories, Home Consultant Products, Novelties, Wooden Art, Holiday Decor & Gifts, Canned & Homemade Food Items and much much more! Two locations, conveniently located across the street from each other located on the 1200/1300 blocks of North Washington Avenue. Click here for a list of Home Direct Sales vendors currently registered for 2018!